"41CE12-6, Burial AH-1" by Timothy K. Perttula and Robert Z. Selden Jr.
DECORATION (INCLUDING MOTIF AND ELEMENTS WHEN APPARENT): The lip of the vessel is lip notched. The rim panel is defined by single upper and lower horizontal engraved lines, and the panel is divided into six sections by excised vertical lines that have a small triangular element at the top and bottom of the vertical lines. Poynor Engraved, var. 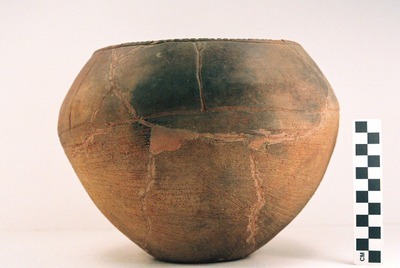 Blackburn carinated bowl from the Jim P. Allen site.